White pepper is native to south India. White pepper comes from a flowering vine in the family Piperaceae. Black and white peppercorns are both the fruit of the pepper plant, but they are processed differently. Whole black peppercorns are actually berries while white pepper is the seed of those berries. White pepper has a different flavor and heat component than black pepper. White pepper is described as being spicier and fruitier than black pepper, but less complex. Some say it has a musty or earthy flavor others say slightly smoky. White pepper should be added after the dish has been cooked, as overheating can release a bitter flavor. 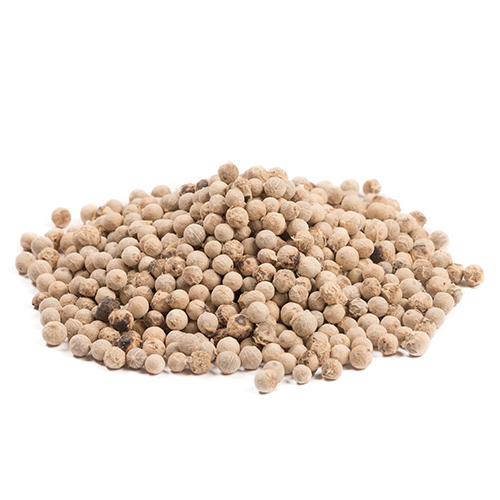 White pepper is known for its sharp bite and is used to add extra flavor to Chinese soups, marinades for meat and poultry, and spicier stir-frys. White pepper is mostly used in white sauces and dishes such as potatoes where the color of black pepper would detract from the appearance of the dish. Sowing pepper seeds can be done, but only fresh seeds are germinated, seeds are viable for very short period. The pepper plant loves extremely humid climates where temperature never falls below 60 F (16 C). Pepper fruit is harvested before maturity and dried in the hot sun. After drying it becomes wrinkled and black. White pepper is made from fully ripe pepper berries. They are soaked in water for about 10 days, leading to fermentation then their skins are removed.